My grandma gave me this domed gold ring, a family heirloom, when I turned 18. She put it on my finger, and told me to wear it to college parties, where it would surely capture the attention of gentleman suitors. Oh, grandma, how I love you! I have never worn the ring – it is massive, exquisite, priceless, and completely clashes with my un-manicured, pudgy, short fingers and jeans-clad body. My grandma asks me about it, wonders if I’ve been wearing it, and I tell her that I haven’t, but that there’s no way I’m giving it back. Every gram of that ring, every curve, every stroke of the design is her gift to me, her love for me. The shawl I knit for grandma is hardly a Wedding Ring Shawl – it’s not the right size or shape or yarn or color, and it’s not that fine. 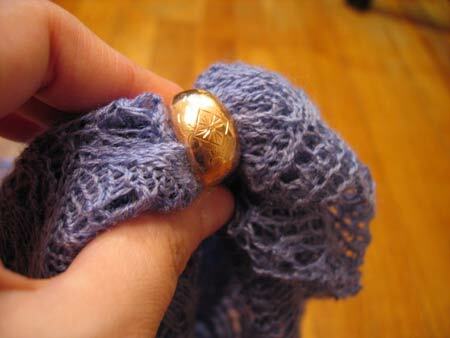 But there is something special about passing a delicate fabric through a metal ring, the shawl I knit for grandma through the ring she gave to me, one form of love through another. Finishing this shawl was not anti-climactic. I am so happy and so pleased, and these feelings definitely alleviate (although not completely erase) all the frustrations I went through while dealing with the shoddy pattern. I think my grandma will really love this shawl, and I’m left itching to knit some more lace! Pattern: Misty Morning Shawl, distributed by The Alpaca Yarn Company (formerly America’s Alpaca), designed by Sharon Winsauer of Aurora Alpacas. Corrections for this pattern can be found here. Needles: 2.5 mm (US 1) and 3.0 mm (US 2) Metal Dowels. 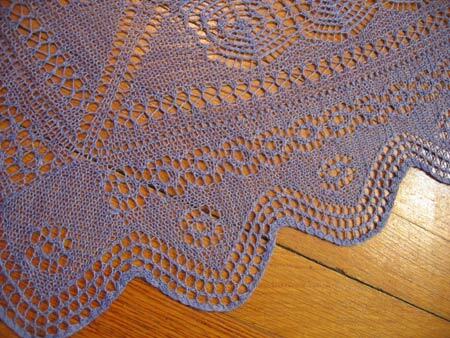 For the last two borders of the shawl, I got smarter and used Inox – the gray Teflon-coated aluminum ones. I don’t know whether the package was marked US 2 (supposedly 2.75 mm) or US 3 (supposedly 3.25 mm), but they are 3.0 mm in diameter according to my calipers. Yarn: Lorna’s Laces Helen’s Lace, 50% silk/50% wool, color periwinkle (49 ns). I used about two-thirds of a skein (850 yards), and have enough yarn left over for a lacey scarf or something. Simply put, this stuff rocks! Would definitely use again. Finished size: 54″ across the top, 34.5″ deep. Guess what? Many (bandwidth-sucking) photos in the extended entry – check it out by clicking below! Oh, Kathy, it is gorgeous! I’m itchy to knit lace just looking at it. Your grandma is going to fall over. Hm, which might not be a good thing, hehe. That is exquisite (I especially love the subtle color variegation). I can’t believe your patience in finishing this thing! But it was well worth it. I’m sure your grandma (who sounds so cute!) will adore it. It looks absolutely gorgeous! Your grandmother is going to love it. Isn’t the magic of lace amazing? Oh, and the ring is beautiful, too! How sweet of her! Wow- I’ve never knit lace before, and this is so gorgeous that it makes me want to try! Great job – your grandmother will love it! Sweet. You do good work, gal. Your shawl is gorgeous and looks so delicate. I just took up loom knitting in November, but after looking at the lace you have knitted, and the Odessa hat, and the beautiful socks that are made with needles, I may have to take up needle knitting too! It’s really breathtaking. The changes you made make it so much prettier. Beautiful, beautiful. Your Grandma will be stunned. Stunning work. Lace is addictive, but the results are so worth it. [Thunk–ouch!] Sorry, my jaw just hit my desk. Absolutely gorgeous. Absolutely beautiful! It looks like it was worth every second you spent on it. Breathtakingly gorgeous! And I love the image of passing it through the ring. Just wonderful. Let me join the chorus: it’s beautiful! A masterpiece! Absolutely stunning! You did a magnificent job, and I know your grandmother will adore it!!!! It’s gorgeous! Your grandmother will love it! Truly fabulous. The fact that you made that many corrections and persevered just boggles my mind. Stunning. I am sure your grandmother will love it. Your work is so amazing! I’m wondering if you’re ever going to share with us the response from the, ahem, designer (and I do use that term loosely) of this pattern? Words cannot describe it. Your grandmother will love it and your mother will be jealous! Oh! So, so beautiful – so worth it. Stunning! The shawl looks amazing. Dare I say – it was worth all of the trouble? It’s gorgeous! Your grandma will love it. Congratulations on your creation! Absolutely perfect, and passing it through the ring is tremendously symbolic. She is going to be so moved when she sees it! Wow. Such a masterpiece. And after all the work you put into the pattern corrections you should be listed as a co-designer for it! The ring story. *gulp* Really choked me up. How special. It’s absolutely perfect! Your Grandma will be so thrilled. OMG! It’s better than I imagined (and I imagined pretty freakin’ fabulous)! Your grandma is going to flip when she sees it. I bet she doesn’t take it off for weeks, maybe months. It’s absolutely perfect. You really should be soooo proud of yourself. That is an heirloom in its own right. when i read the first three lines my eyes filled with tears. great job on creating your own family heirloom. i hope it ends up in an antique store on a distant planet 100years into the future. Wow, I am utterly speechless looking at that shawl. There are no words to describe what an outstanding job you did. You must be so pleased with yourself – it is truly a work of art. Wow, that is gorgeous! Do your corrections also include your modifications to the shape? Now that you’ve done all of that hard work to fix the designer’s mistakes, I think I may want to make that. Great yarn! Truly beautiful. Hopefully it was worth all the hard work, because it looks amazing. Wow, that is simply stunning. Congratulations on a new family heirloom. You inspire me to go beyond my comfort zone. That is stunning. I’m sure your grandmother will love it. I love that border. Gorgeous. Did I miss why you changed the shape of it? The shawl is beautiful, but the entertainment your knitting of this shawl has provided the Internets is seriously the best part. Stunning. That shawl is absolutely beautiful. A new family heirloom. WOW. Breathless, speechless at how gorgeous that turned out. And also at your perseverance in the face of a craptacular pattern. You’ve written another chapter in making lemonade out of lemons. Brava! Absolutely gorgeous! Your grandmother is going to love it and know that every stich was made with your love for her. What an amazing gift. It is absolutely GORGEOUS!! I’m so impressed. Your grandmother will love it. The shawl is truly beautiful, and I know your grandmother will treasure it. I am amazed and inspired by your perserverence through faulty patterns. I think most of us would have kicked it to the curb in a big heap. Your tenacity more than paid off in this work of art. It is gorgeous, I would never have had the patience, your Grandmother is going to love it. Absolutely beautiful! I would love to be a fly on the wall when you present it to your grandma. What a lovely, lovely gift. that is beautiful… my afghans are simple projects compared to that. oh, and you should totally wear that ring. that ring deserves to be worn even when you’re wearing jeans. It’s beautiful. We’re definitely going to need a picture of Gramma wearing it. the shawl is perfection! 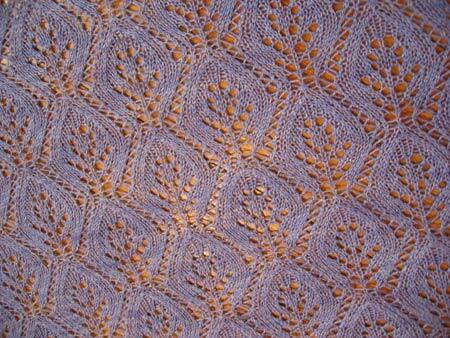 I love the Helen’s Lace for shawls. Great job, and I have been reading about your trials with this. I’m not sure I would have stuck it out……..
Beautiful! The patience and love for your grandma that went into this shawl make it one of the most lovely I have ever seen. Stunning! I love the picture of it going through the ring. I am seriously in awe of that project. You rock sistah. 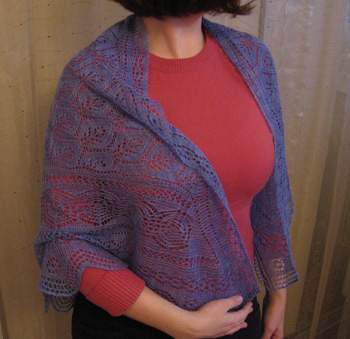 I feel that this word is overused in our commenting, but your shawl is gorgeous! Your grandma will be so proud of you and your skills. All the trouble you went through was worth it…well kinda. GORGEOUS! just gorgeous.. that’s going to be an heirloom for sure. congratulations! Wow!!! Your shawl is gorgeous. I am about to start my first lace project (a shawl) and I can only hope that mine comes out half as nice. I’m not sure I’d have the patience to work thru all of the stuff that you did tho. it’s gorgeous. are you mailing it to grandma or presenting it in person? Wonderful and worthy of your grandmother! Your tribute to your grandmother was heartwarming as well. You raised the bar for us newish knitters, Grumperina! Oh my goodness, it’s gorgeous. You did an amazing job, especially with so many pattern difficulties. Oh. My. Effing. God. That shawl is stunning, absolutely stunning. I’m speechless. I honestly don’t know what else I can say. It’s a work of art, that’s what that shawl is. Wowers. Your grandmother= sooooooooooooo lucky! And I love the story behind your grandmother’s ring. That gold ring is gorgeous. No! Nonono! Today is the start of the knitting olympics — I am not knitting lace. You are a mean one, Grumperina! Trying to tempt us all away with your lacy ways, on the very first day. It is spectacular. Congratulations to the bravest knitter around. I learn alot from your site. What precious gifts–the ring, the shawl, your love for your grandma and her love for you!!! The shawl is beyond gorgeous, and all the more precious for all the persistence you put into it. Your grandma would REALLY be proud of that. And you should wear the ring, you know. Sometimes, just because. Really lovely work. Beautiful colour, too. Wow, wow, wow, this shawl takes my breath away. Deffinately worth every aggrevating correction! Wow! I love the fact that your grandma told you to wear the ring to college parties to attract male suitors. She is the cutest thing. She must never know the truth. It is a gorgeous, gorgeous shawl and she will love it! Now, I want to knit more lace, too! I would cry if I were your grandmother. You are wonderful! The shawl is stunning. I can’t wait to see photos of your Grandmother wearing it. She is going to love it! Just beautiful! In the end, was it all worth it? you are a dang GENIUS! It’s breathtaking, like awesome enough to make me try lace VERY SOON! WOW! I nearly cried when I saw it. Okay, so I’m just echoing here, but it’s truly amazing, I can absolutely feel your love. I wish my grandma is still here. Hiya! I’ve been reading for a long time and I just had to comment. This is the prettiest shawl and I think it is definitely worth every frustrated forehead cringe, documented or not. That is just stunning – it was neat watching the process and how diligent you are with details. Brilliant work. Absolutely beautiful–both the shawl and the story about the ring and the love you and your family share. You’re making me all misty. Oh my goodness, that is the definition of loveliness itself. You rock. That is absolutely beautiful. I’ve been following this shawl from the beginning, and I’m so glad you didn’t give up on it. Your grandmother will love it. And the story about the ring…well, let’s just say I’m going to give my gram a call when I get home today and remind her how much I love her. It’s beautiful. So so beautiful. The love that went into knitting it really shows. 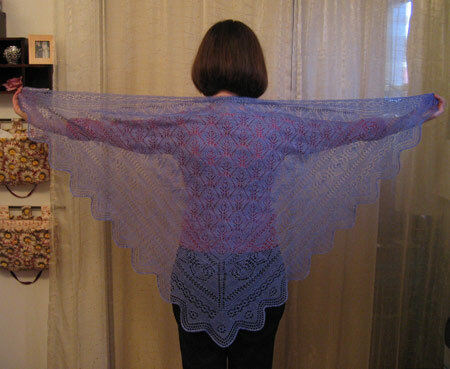 kathy, the shawl is absolutely gorgeous. the detail of the work is amazing. you should be very proud. and one lucky grandma! oh yes. beautiful. gorgeous. and that ring – you are crazy for not wearing it! often i say to myself, ‘they have so many comments already’ and don’t bother to leave yet another that says the same thing… but this time, you could reach the thousands of comments and they wouldn’t be enough to capture my esteem for your fine work. fabulous. Okay, here I go: YOU’VE inspired me Ms. Grumperina! I’m starting my first lace project for the Knitting Olympics. I’m doing a wider scarf (somewhere between a scarf and stole), a rectangle, no increases, using Walker’s Open Work Leaf Pattern in Treasury vol.#1. I’m a decent knitter but I’ve never done lace before. Beautiful shawl and inspiring to see you stick to it and correct the pattern’s mistakes and create something exquisite. Truly beautiful and amazing. Your grandmother is going to love it!! What wonderful work you do. I’m always left impressed. Kathy, it’s truly a work of art. So beautiful! It is breathtaking! It is everything that good lace should be. And most certainly worth the headaches. How can you bear to give it away though? Wow, that is beautiful! I’ve seen how much of your hard work went onti it and really appreciate you sharing it with us. We are opening a teeny tiny knitting shop in Barcelona and I was debating about Helen’s Laces, but you have convinced me! This yarn will be included on our first order! Adding another vote to the “beautiful” choice! The gorgeous ring, the absolutely stunning shawl…. the love you and your grandmother will cherish forever. bitten by the lace bug… it is very addicitve and you are right, much more fun because of the challenge. Fabulous! Thanks for using all that bandwidth to really show it off. It looks wonderful on you (just saying). It’s gorgeous. You did a wonderful job and your grandmother is a very lucky lady. 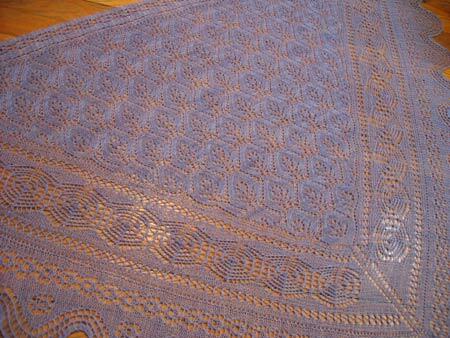 What a gorgeous shawl, and what an absolutely phenomenal job you did deciphering and correcting the pattern! I am the one zillionth person to say this, but I’ve followed along with this saga, and I am SO impressed with your determination to get to the end of the shawl. The result is absolutely STUNNING! Congratulations, you are an inspiration to me! Kathy, I am gobsmacked. It’s stunning. Beautiful. Perfect. How incredibly extra-ordinary and inspiring! I so need to dig out the skein of Helen’s Lace that I have buried in my own stash. Gorgeous, stunning, exquisite…there aren’t enough words to describe it. You did a magnificent job, and you should be so proud, after everything you went through, that it turned out so well. And now you’ve been bitten by the lace bug. The lace disease is impossible to get rid of, you know! This is absolutely gorgeous! If I can guarantee such an amazing outcome, I’d start knitting that lace this very second! This is absolutely one of the most beautiful shawls I have ever seen – the color, the pattern, everything! It was so worth the insane amoung of work you put into correcting the pattern. Gorgeous! Thanks so much for sharing the whole process! It was sort of like an epic poem – with a happy ending. I bow down before your persistence, commitment and the breathtaking beauty of the finished product. It’s amazing. You’re amazing. You should send the designer and the company that you bought the pattern from a bill. P.S. And all this while you are working on your PHD. Kathy, Your persistence and attention to detail always impress me. What a beautiful finished shawl. I can’t wait to hear Grandma’s reaction. Long time lurker, first time commenter. I’ve been enjoying reading your blog for awhile–and I just couldn’t let this post go by without a comment. The shawl is incredible. Really beautiful! Congratulations. I’m sure your grandmother will adore it. That is astounding. You must be so proud, and your Grandma is going to be amazed when she sees it. The shawl is simply exquisite. Lovely, just lovely! THank you for sharing the pictures! It is gorgeous! Lovely, just lovely. About the ring, couldn’t you wear it on a pretty chain around your neck? Just a thought. Stunning! I am truly amazed! Your grandma is one lucky woman! I SO want to see Grandma’s face when she takes it out of the box! Oh Kathy – it’s wonderful!! Exquisite work(wo)manship and the extra calculations that you had do – your grandmother will treasure this for a long time and I’m sure that it will become a family heirloom. Most of the time, I decide that my comments on how beautiful something you’ve created add nothing to the conversation. I smile and acknowledge your skill, then move on. 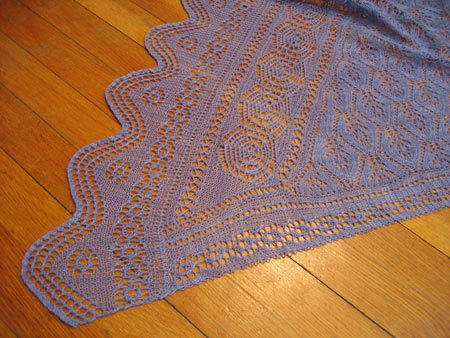 It probably doesn’t this time either, except that this labor of love in periwinkle lace is draw-droppingly gorgeous! I couldn’t smile and move on this time. If I wasn’t impressive before (and believe me, I was), I would be now. The shawl is beautiful, you did a wonderful job. BTW, I was also inspired by the beatiful pictures of the Leaf Lace shawl you knit earlier for your mother, and have ordered the pattern to one of the LYS’s here. I’d rather knit from a well-done pattern than a confusing one. Maybe after a few more lace projects…nah. I don’t roll that way. You’re one in a million the way you approach patterns. no honey. completly compliments your accomplished talented confident beautiful full of love hands. Your shawl is a work of art – it REALLY is. It’s just amazing. And knowing the effort to took to make it just makes it that much more beautiful. Your grandmother will adore it!!! that shawl is gorgeous. I am not a lace person. I am not a shawl person. I’m not even into purple as a color. But I would wear THAT with pride. Well done, O pioneer of knitting patterns reinvented! I know you think it’s weird for people to want to see pictures of your family with your handknits, but I would sure love to see your Grandma’s face when she gets that very lovely shawl. You can just see the love you share wrapped up in it. I was very touched that you passed your love gift through her love gift. You’re a very blessed young woman to appreciate the love of your family and to have them appreciate you. And I’m sure that your grandma will treasure your shawl forever. GARGEOUS!!!!!!!!! You are a knitting freak o’ nature!!!!!!!!! Stunning,superb,fantastic and totally fab ! A really beautiful shawl. A true work of art. Well done,especially with working your way through the pattern. That is so gorgeous! You look wonderful in it also. Could you give the rest of us guidance in modifying the pattern? Kathy – It is absolutely stunning!! But even more important is the beauty of the love you placed in every stitch. Your Gram will love it – I am sure. Beautiful! As is your love for your Grandma! I don’t know what else I can say that the others havent… stunning miss. Your grandma will LOVE it! I know it was hard but seriously, Kathy, looking at it there’s no way it wasn’t worth it. Grandma is going to love it and cherish it forever!!! I looks light as a feather and just so gorgeous. You really outdid yourself this time. both the shawl and the ring are absolutely stunning. i am in awe of your skills, especially when it comes to getting to the bottom of any problems! Amazing! You are a wonderful granddaughter. Holy lace! That’s so fab. I might just have to print off all those corrections and find the actual pattern for myself. You don’t need another person to tell you how beautiful it is, so I’ll just tell you that using calipers to measure needles is brilliant. It’s the kind of thing that is so obvious once you find out about it, but also something I would never put together myself. Absolutely stunning. 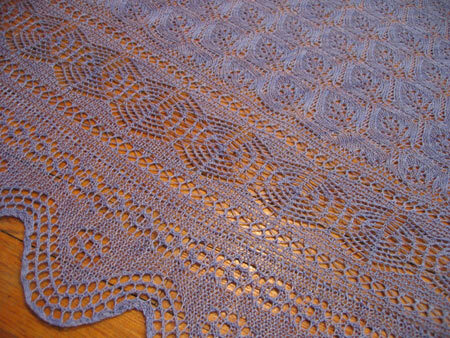 I am embarassed to say that I have ever knit lace…THIS is lace knitting! I bow down to you. Absolutely beautiful! I’m so glad you’re obviously so happy with it after all you’ve been through to get it perfect. It’s a magnificent shawl and I’m sure your grandmother will feel the immense love when she’s wearing it. Congratulations! Your grandma is going to be speechless! What a beautiful shawl!!! Ah, and hearing you talk about her makes me miss my granny. You have to let us know what she thinks of it! Absolutely beautiful – and all the more so considering how much effort you put into getting it right! It is a beautiful shawl, congrats! Now welcome to the world of lace knitting and knitting-lace. Once you get here there is no turning back. I have been knitting lace for many many years and love it. The shawl is absolutely beautiful. I’ve been waiting to cast on for the leaf lace shawl for a month now(I promised my huband a sweater…he’s 6’2″…)…but I think it is going to have to be today! Beautiful! brava, maestra! i hope my peacock shawl looks half as good when i get it done! Absolutely perfect. It’s so beautiful, your grandmother will be stunned. And I love love love the beginning of your post, tying one family heirloom in with another (new) one. Your grandmother’s shawl is absolutely gorgeous!! Stunning and exquisite, it’s destined to become a family heirloom, just like your ring. Beautiful job! There are no words to completely describe such a beautiful object and the love entwined in every stitch. Congratulations! I never did thank you for emailing me back about Combination Knitting in December, but I am using that now and loving it. I’ve also bought all the supplies for the Odessa, once I’ve knocked out a couple of other projects on the needles. Congratulations and keep on knitting! You are an inspiration. definite proof that you and your grandmother are related: the amount of caring and beauty in both gifts is so touching. Ooooh, that is so beautiful. Your grandma will love it. And I loved the story about the ring. That shawl really is amazing… great job! And thank you thank you thank you for your combined conversion table, you have saved my olympics project! It’s simply too beautiful for words! Its definately an heirloom we are all in awe of. congratulations! it’s simply beautiful, a real treasure. Even my teenage son, who barely pays attention when I knit, thought your shawl was “WOW!” Congratulations! Simply beautiful. 🙂 And it’s been interesting reading about your experience altering the shawl. all your struggles were definitely worth it, the shawl is breathtaking. Wow. When I saw your first pics of this shawl, I thought, “Why would anyone be such a masochist? 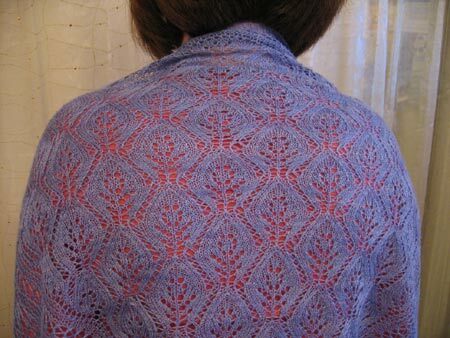 A lace knitting shawl?” I have revised my opinion; the end result is stunning and well worth your effort, especially considering it’s going to your grandmother. That shawl is going to rock her world! Holy nards, thats beautiful! You do wonderful work. No matter what the eff-ups with the pattern. Your grandma is going to LOVE it. And your mother is going to want one….and so will I. You are a rock star (of the knitting sort)! That’s absolutely gorgeous! Wow, Kathy! This is seriously one of the most AMAZING things I have ever seen. Absolutely beautiful. that is ridiculously, stunning gorgeous. an unreal accomplishment. i read knit blogs all the time, yours included, and i’ve never commented on a project, however much i may have admired it. but this is a class all its own. Your grandma will love it!! Wow wow wow wow wow!! It’s stunning. I especially love the border. I’d love to know how you managed to block it so beautifully. I look forward to reading all about your grandmother’s reactions. That’s one lucky grandma. 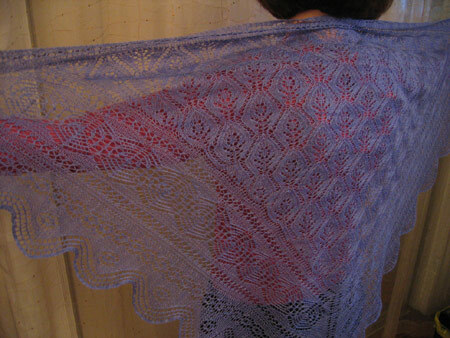 And one beautiful shawl. The shawl is absolutely stunning! You do wonderful work! You are truly a lace knitting goddess. I am in awe of your tenacity to knit this shawl. It speaks volumes of your love for your grandma. Wear the ring and let Grandma see you wear it. It will make her heart sing. Hy !! i’m french !! excuse me for my english. Congratulation for your realisation it’s very beatiful !!! I just found your site. This shawl is incredible. You are an amazing knitter. I’m going to try knitting your Odessa pattern, that will be a challenge for me.